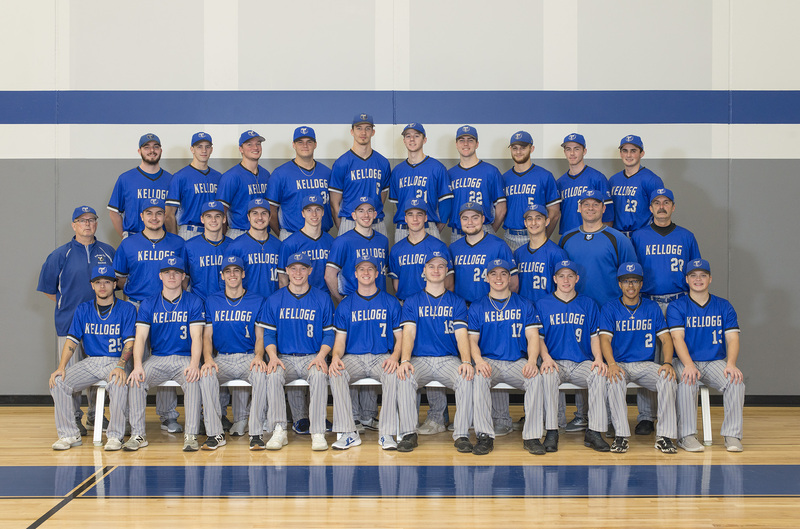 Kellogg Community College’s baseball team is ranked 10th in the nation in Collegiate Baseball Newspaper’s latest National Junior College Athletic Association 2019 Div. 2 Pre-Season Poll, released in December. The Bruins are the only team in Michigan that appears on the list, which includes the top 20 teams in the division in the nation, according to the combined rankings of regional NJCAA coaches. Eric Laskovy, KCC’s head baseball coach and a physical education professor at the College, said the Bruins have been nationally ranked in various polls at some point in the season 13 out of the last 14 years. While it’s nice to be recognized at the national level, Laskovy said the team doesn’t allow the rankings to create added pressure going into the season, which opens next month. Winning hasn’t been a problem for the team the past few years. The Bruins qualified for the NJCAA D2 World Series six times since 1999, and have claimed 11 Michigan Community College Athletic Association Conference Championships — nine since 2005. The team ended the spring 2018 season as the runner-up in the NJCAA Region XII Baseball Tournament, and finished the season as MCCAA Western Conference and State champions with an overall record of 45-8 and a conference record of 22-1. Nine KCC baseball players were awarded postseason athletic awards from the MCCAA, and 14 earned postseason academic awards from the MCCAA. Sophomore Logan Briggs, of Traverse City, was honored as the College’s male Scholar-Athlete of the Year, and Head Coach Laskovy was named MCCAA Coach of the Year. It’s the eighth MCCAA Coach of the Year award won by Laskovy, who last season finished his 19th year of coaching baseball at KCC and 12th as the head coach. The Bruins this year will again kick off their season with the team’s annual spring trip to Eunice, Louisiana, in February, where they’ll play the first three games of their schedule against Louisiana State University Eunice — the team ranked first in the nation in the Collegiate Baseball poll. Laskovy said this year’s team has been terrific, coachable and fun to be around. They’re returning a nice nucleus on the mound, he said, but are counting on a lot of first-year guys offensively. “If we stay relatively healthy, we will take some lumps early with a difficult schedule, but be ready to compete with anyone come playoff time,” Laskovy said. For more information about KCC baseball, visit www.kellogg.edu/baseball.